Going green couldn’t be easier! 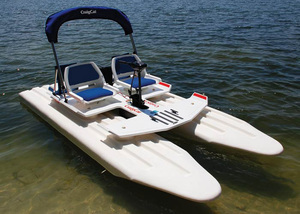 This battery-powered alternative cruiser is whisper quiet and extremely easy to operate thanks to point-and-go steering. The CraigCat® Electric will allow you to get up close and personal with nature like you’ve never thought possible. It is powerful enough to run for many hours on the water on a single charge! CE Certified for Europe.